(1935) Clifton’s Cafeteria, downtown L.A. | Remains of L.A. The second floor has a redwood tree with a fireplace in it. 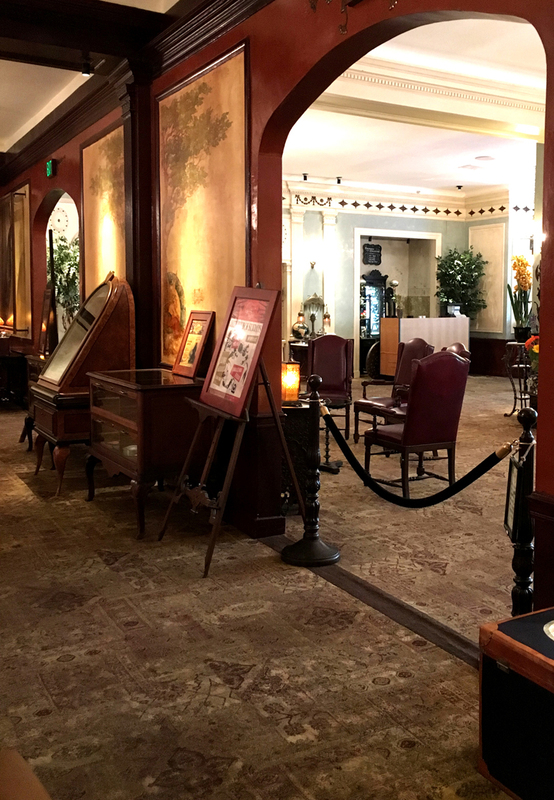 There is a grand piano and a bar near the redwood, and sitting areas with chairs and sofas in semi-circles, and lots of tables and chairs like on the first floor. Some of the tables appear to be large slices of redwood tree. 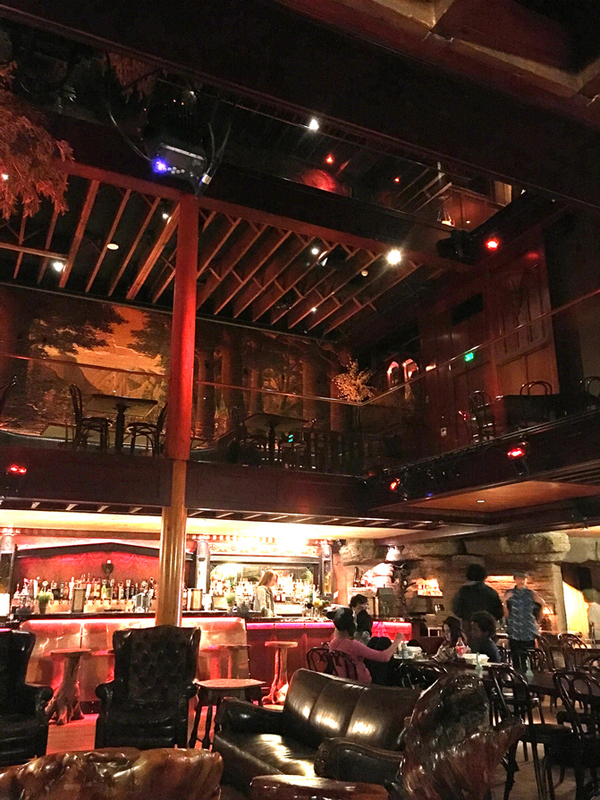 The third floor is all old Hollywood glamour, with another bar and a large room with a bandstand. All over the place are stuffed animals on display in dioramas, and all sorts of awesome things to look at. I felt like I could have spent days there and not seen it all. I’m definitely leaving a lot out here, it feels impossible to include everything. -There was so much food it was hard to choose, but I finally went with the meatloaf, because there was a sign that said “try our delicious meatloaf” and also because I could see it was the kind I like with tomato sauce, and I’d recently had meatloaf with brown gravy which is the opposite of the kind I like. It came with a choice of sides; I asked the guy serving them which were his favorites and learned that this was his first day working at Clifton’s and so he had no real opinion. I went with roasted vegetables and what turned out to be really terrific stuffing, and a dinner roll. It was all exactly as good as you would expect from a place with cafeteria in its name, or maybe even a little better. I also got a fruit cup, because I like fruit cups and they had no sugar-free dessert. I convinced David (my husband) to get the jello because it is such a good, traditional cafeteria dessert. -When you go inside you turn right to walk to the cafeteria entrance. There is a wall there with a very clean, very shiny mirror. I was less than two feet away when I realized it was a mirror, and not another room. I felt foolish but then heard the women behind me exclaiming over having made the same mistake, and a guy who works there assuring them that it happens constantly. -The ladies’ room in the basement is amazing, with old-fashioned wallpaper covered in butterflies and birds. The music was from the twenties or thirties; some guy warbling about a pretty girl in a boat. 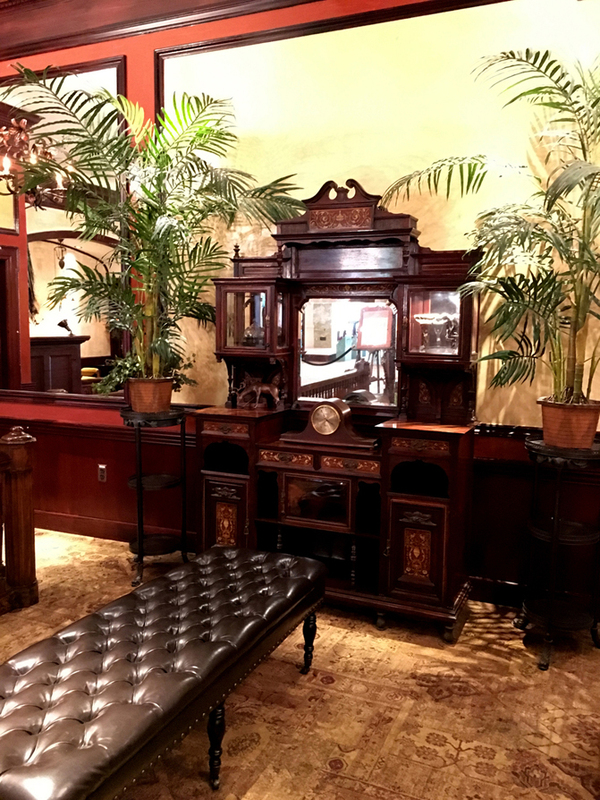 There was an old wooden phone booth and a lovely little sofa and if there’s anywhere in LA where one can accidentally slip back in time 80 years, this is probably the place. -In the cafeteria there is a big metal contraption with dispensers for milk and faded paper labels; nonfat milk and low fat milk and chocolate milk. It is just like the one at my camp when I was a kid. It made me want a glass of chocolate milk like crazy, even though I can’t have sugar and I don’t like milk. -We decided to sit upstairs on the second floor, right near the big redwood tree with the fireplace inside it. 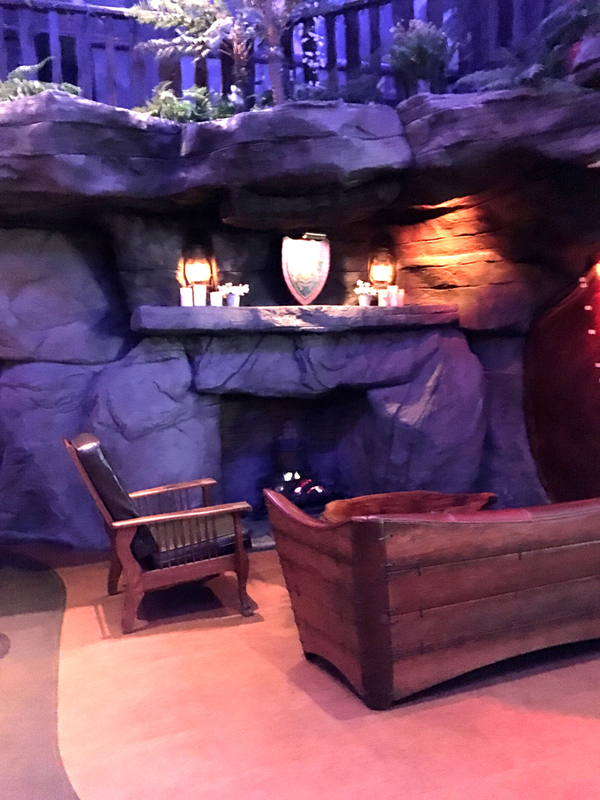 Near us was a sitting area with a chair made of antlers, which looked like something out of a South Western remake of Beetlejuice, and another made of horns–I guess ox horns? I don’t really know from horns. I tried sitting in the horn chair; it was comfortable but surprisingly springy. Next to us was a big stuffed stag, posed in a glass case with rocks and bushes, and a forest scene painted behind him. 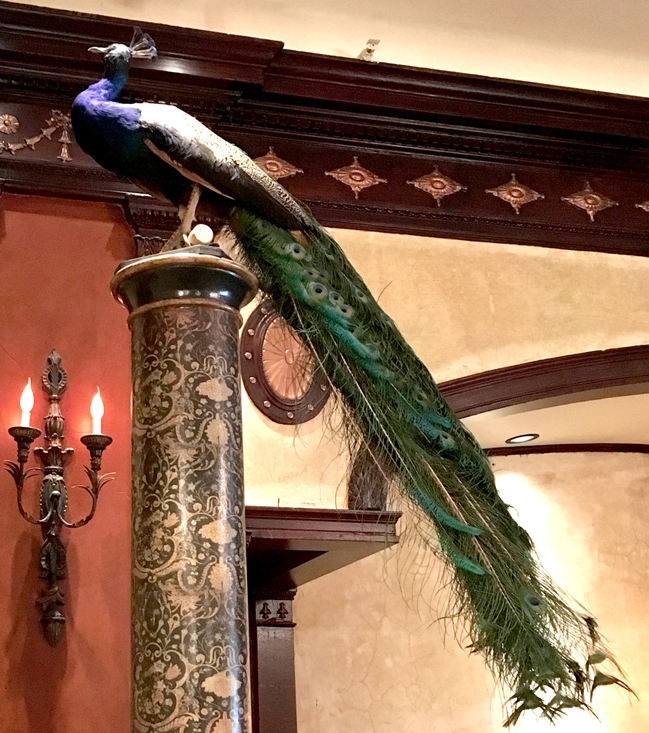 I generally get creeped out over dead stuffed animals in restaurants, but usually it’s just their heads displayed as hunting trophies and the feeling is “hey look what I killed!”; with the animals in Clifton’s it was much more like you’d see in a museum, and so it didn’t bother me in the same way. -I was so overwhelmed I forgot to get a napkin; luckily David (my husband) got several so I took one of his while he was away getting a drink at the bar. -David (my husband) got a drink called a “bear float” and it came in a mug shaped like a bear that we got to keep! It is a really lovely mug, black and angular and it was like it was made by someone who had never seen a bear, but had seen lots of art deco buildings decorated with bears. The float had root beer and rum in it. -There was a woman at the table next to ours, eating alone, reading a book. I thought when I saw her that I wanted to come here and sit alone reading as often as possible. When she stood up, we realized she was someone we knew, so that was neat. -There were signs all around the fire in the tree that said “For your safety please do not touch” and “Caution! Extremely hot surface!” and “Do not touch!” I bet you someone thought it was a fake fire. -It was fun to watch the other people eat; it was about an even mix of people incredibly excited about being in this super cool place, and people just eating lunch like any other day. -Next to the bar was a screen showing black and white photos of old downtown L.A. At first I thought it was just a large photograph hanging there, until the picture changed. It was the least-obnoxious screen I’ve ever seen in a bar. -David (my husband) got a quinoa salad. He said he wanted to tell me how much he was enjoying it, but didn’t want me to have to try to make a note about it and deal with how hard it is to spell. I was a bit hurt that he didn’t trust me to know how to spell quinoa. Pronouncing it is the thing that I can not do. -In front of the fireplace that is inside the redwood tree is a long couch. Three young hipster girls sat on the couch with their trays balanced on their knees, eating with chopsticks. I understand wanting to eat by the fire, but I still think it would have been much easier for them to just sit at a table. They looked nervous about spilling the whole time we were there. And then a poem called “A Lesson from the Sequoia” by Alice Maud Carvell. David (my husband) and I went in and sat on the tiny bench. There’s a little lit diorama with a forest scene, and a stained glass window. It was very peaceful and quiet. 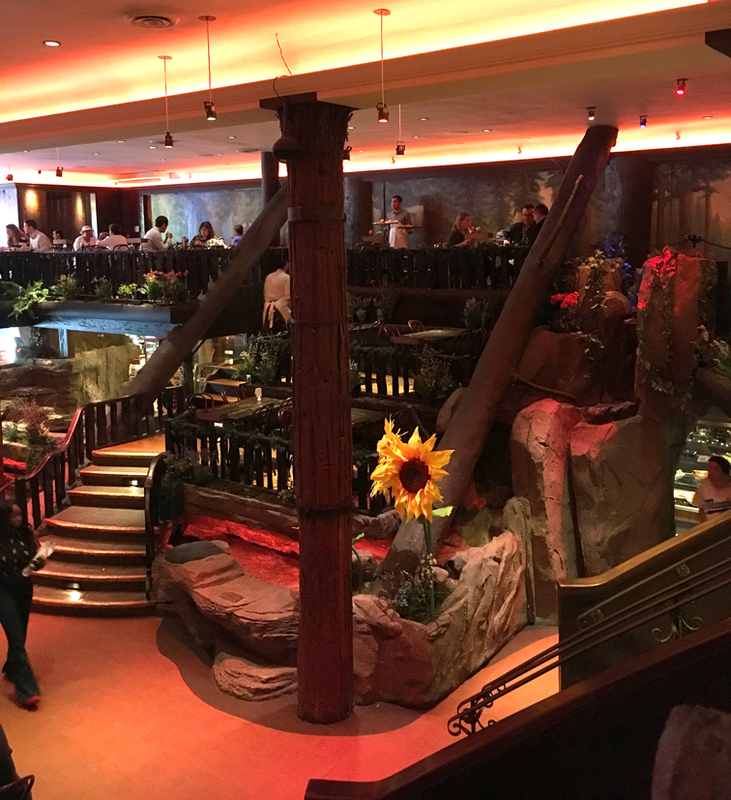 -We walked around the second floor; away from the bar there are a lot more tables, and the top of the stone water fall that goes down to the second floor, and benches that remind me of the Pinocchio area of Disneyland. Each table had a nice little pot of flowers on it. 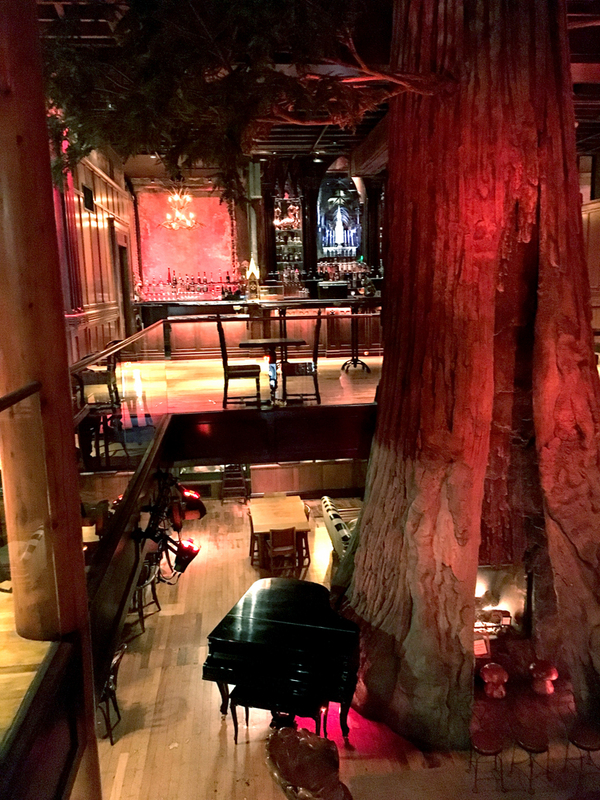 In the corners were the big tables made from redwood trees, and over them were chandeliers made of antlers. -A bunch of women came in wearing red hats. I assumed they were members of the Red Hat Society which I always thought sounded like a lot of fun. Of course they may also have just been a bunch of women who happened to be wearing hats that happened to be red. -We walked up a broad wooden staircase to the third floor, which might be the most glamorous, elegant place I’ve ever been. 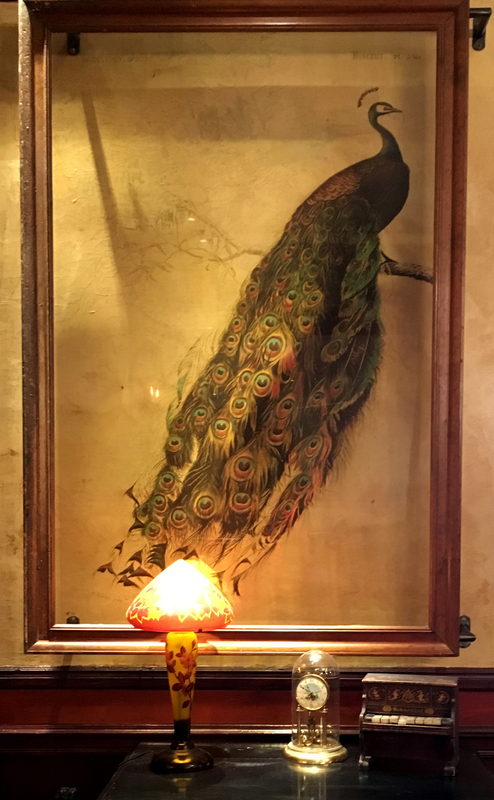 Stuffed peacocks, and paintings of peacocks, and beautiful old furniture, and a bar that looked like something out of a movie about incredibly wealthy people from just before the war, and a large bandstand in a section that was closed off until evening. In the bar, there were mahogany railings with carved animal heads, an eagle and a bear and what I think was a very angry badger. Lots of little areas with antique couches and chairs for sitting and visiting, and everything was lush and elegant and marvelous. It felt like a movie set for a totally unbelievable movie. David (my husband) and I sat down in large, cushy arm chairs and considered never leaving. -There is a display case with what seems to be a bunch of stuff from the old days of Clifton’s. There’s a pamphlet titled “Clifton’s Multi-Purpose Meal,” a silver hand mirror, opera glasses, a little calendar that says “A June Bride in Her Own Home,” a booklet titled “My Best Recipes by Kate Brew Vaughn,” what seemed to be a manicure kit in a leather hinged box, a bar of fancy wrapped hand soap, a very old padlock that says “Pluto,” and a bunch of old postcards. The case also has some old-timey black and white photographs with a card that says, “These photographs were taken for Life Magazine by Ralph Crane and are in addition to the ones published in the Nov. 27th issue of Life.” I’m having a hard time coping with the fact that they do not include a year. –There is a coat of arms on the wall that says “Loyalty Knows No Shame.” It has greyhounds on it (or maybe whippets, it’s very hard to tell in an engraving with nothing else to indicate scale). I like it because it could also be a Hufflepuff motto. -A glass case has a silver teapot and this letter, dated Aug 19, 2009: “To Whom it may concern: In Sept 1942 my husband and I were dining at Clifton’s Cafeteria. We were on our Honeymoon! I had admired this silver teapot and unbeknownst to me, as we were leaving, he put his sailor hat on it and took it! It has been in our tea pot collection for 67 years and always brought back fond memories! My husband has been gone for 2 years, is he forgiven? Fondly, Virginia.” I’m so glad they put this on display, treated it like something special, kept the fond memories going. -In the gift shop, next to a display of books, there is a hole in the stone wall, down by the floor, maybe two feet high. I knelt down and looked inside, and there’s a little forrest diorama and a stuffed bobcat. It’s clearly there for children to discover. The sort of thing adults wouldn’t usually notice at all; I didn’t see it myself at first and I was looking for cool stuff. David (my husband) saw it and pointed it out to me and even then it seemed like it might just be a hole in the wall. I love it when things are hidden away like that. 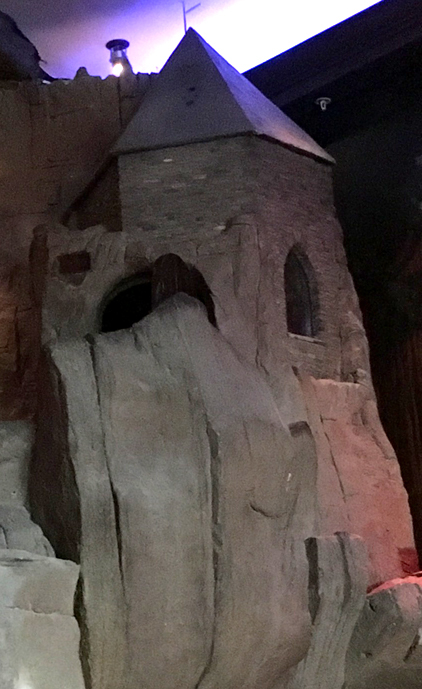 -There’s a big fireplace made of rock near the entrance, and there’s an iron pot hanging over the fire. I couldn’t think of a reason for the pot to be there but when I looked at a picture of the room on an old postcard in the gift shop, the pot was in the fireplace in the thirties, too. Probably not the same pot, but who knows. –There was a pair of little kid sunglasses, pink with flowers, lying on a table in the gift shop area. They weren’t for sale, someone just left them there. I moved them to a more prominent place on the table, so if someone came looking for them they’d be easier to find. -According to a thing I read in a book in the gift shop, at one time, there were signs in Clifton’s that said “Pay what you wish–Dine Free unless delighted.” I also read that back in the ’30s and ’40s and maybe later, there was always a special that included soup and bread and jello and coffee and was extremely cheap, like maybe a nickel, for very poor people. -On the lowest floor by the restrooms is a neon light behind a pane of plexiglass. It’s not a sign that says anything, just a sort of zigzag of old neon piping. 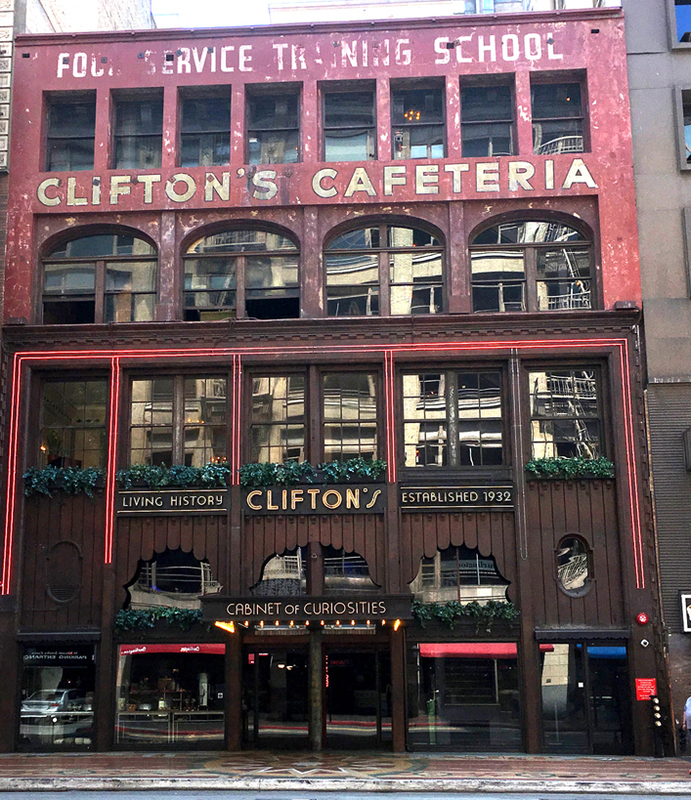 Nearby is a sign that says, “Clifton’s Historic Neon. This neon is the oldest continuously active neon light in the world. It was installed in the mid-1930’s by Clifford Clinton when he created Clfiton’s Brookdale, and was discovered hidden in a wall in 2012–still lit–after having been covered in plywood and plaster when the building was remodeled in 1949.” I find the idea of the neon humming away behind a wall for all those years oddly thrilling. -In between the doors is a very, very old painted pillar that says “Florists –Wedding-Funeral-Design $1.00 and up.” Which I assume means this building had a florist before it was Clifton’s? That was more than 80 years ago though. It seems like the paint would be gone. What I Ate: Meatloaf, roasted vegetables, stuffing, a fruit cup, a bite of David (my husband)’s jello. Who I Ate With/Things We Talked About: David (my husband); the movie “Ask the Dust,” which apparently has scenes set in Clifton’s or a place like it, the game “Bio Shock,” Walt Disney, old science fiction authors, hypnotherapy. What Sort of Ghost I’d Expect to Find if I Believed in Ghosts Which I do Not: A guy who was so down on his luck it seemed like his luck would never turn around; he was slouched against a lamppost wondering how he was going to get a job if he couldn’t think straight from hunger when a man passed by and told him he looked like he could use a good meal, and suggested Clifton’s Cafeteria, where you could eat free if you didn’t have the nickel for a plate of food. The guy ate at Clifton’s every day for twenty years, free for the first months, and then the nickel special for a couple months after that, and eventually paying extra to cover the meals of other guys who looked hungry. 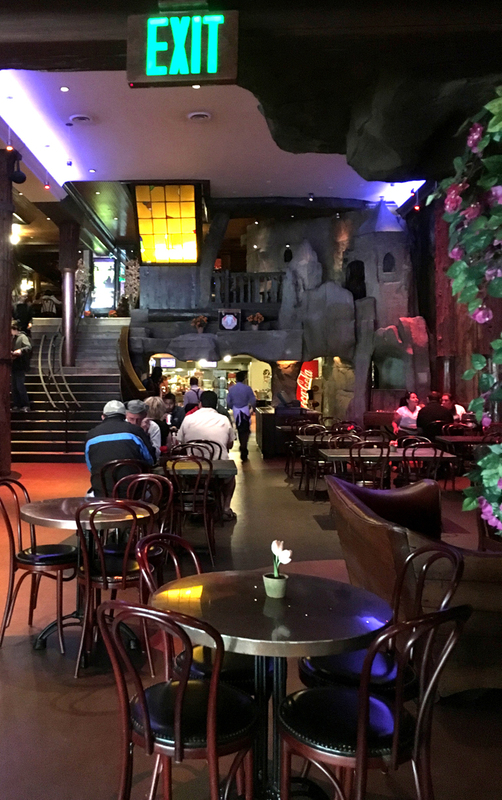 Used to go to Clifton’s as a special treat when I was a little girl. It was mysterious and enchanting; never to be forgotten. I thought it’d closed permanently and it was only history. So glad to hear that it’s reopened! Thank you for my virtual visit. 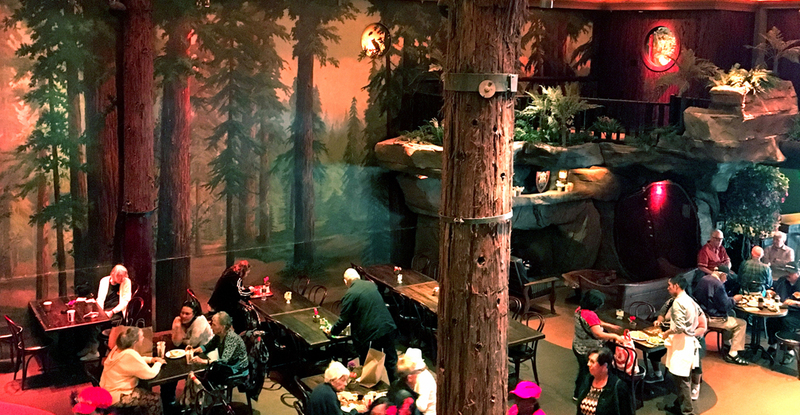 I hope to visit the new Clifton’s some day.